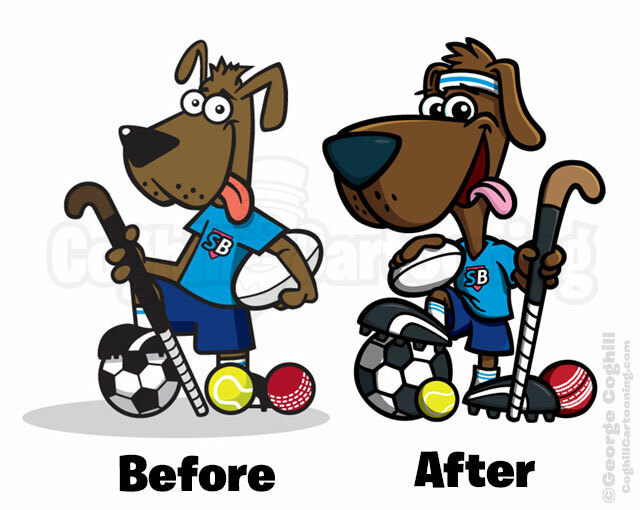 This sporty dog mascot character was created for a client who had an existing mascot character for their business, but wanted to have it recreated and contacted me so they could get their character recreated in the same style of the dog cartoon characters they saw in my portfolio. The “SB” logo on the shirt needed to remain visible. Some of the subtle tweaks I made in the redesign process were to ensure that the cricket bat wasn’t crossing over and covering up the football/soccer ball and leg in an awkward manner as in the original, along with the tennis ball and cricket ball covering up the foot in the original. The final art you see here is 98% identical to the initial sketch I created for the client. By asking the right questions via email before we begin with sketching the art, I can get a very solid idea of which direct to head in, saving time for both the client and myself. The faster my clients can get the artwork in their hands and start using it to generate income, the better! Needless to say the client was exceptionally pleased with the final art.